Small indigenous fish species (SIS) are highly valuable source of macro and micronutrients. Since SIS are eaten in whole or without loss of nutrients from cleaning or as plate waste (Roos et al, 2007), their contribution on micronutrients in-take by human is higher than large carps. Vita-mins and minerals are also found to be much more in these fishes than in large carps (Roos et al, 2007; Thilsted et.al., 1997). P. sophore (Hamilton, 1822) is a tropical SIS found in all over India and commonly distributed throughout Pakistan, Nepal, Bangladesh, Myan-mar, Thailand and Yunnan region in China. It is very much famous as food fish in Bangladesh (Rahman, 2005). In spite of its popularity and endemic nature, it received very little interest from fishery science, especially on food and feeding habits. Other contemporary Puntius sp. like P. sarana, P. ticto or P. gonionotus have ex-tensive reports on their food habits (Islam et al., 2006; Mondol et al., 2005; Pethiyagoda, 1991). No extensive and conclusive reports on food hab-it of P. sophore are available. Shafi and Quddus (1982) briefly reported it as surface dweller fish and feeds on small insects, algae and planktons. Bashar (2011) reported it as larvivorous and her-bivorous and Phukon and Biswas (2012) reported it as omnivorous and column feeder. According to Mookerjee et al. (1946) its food is composed of 40% algae, 15% higher plants, 30% protozoa, 15% insects. All these studies were based only on gut analysis and lack uniformity in suggesting the food habit of the fish. For small fishes, the only way to confirm the food habit is to correlate gut content to body morphometry of the fish. There is hardly any report on food habit of the fish in rela-tion to its morphometry. Present study aimed to understand if there is any relationship of body morphometry to food habit of P. sophore. Samples of P. sophore were collected from dif-ferent ponds of Bolpur, of Birbhum district, West Bengal, India in the month February to March, 2012. The place is located between 23° 32' 30" (right above the tropic of cancer) and 24° 35' 0" north latitude and 87° 5' 25" and 88° 1' 40" east longitudes. Different morphometric characters were doc-umented from freshly collected fishes. Weights are measured in grams (gm) and all lengths are measured in centimeters (cm). 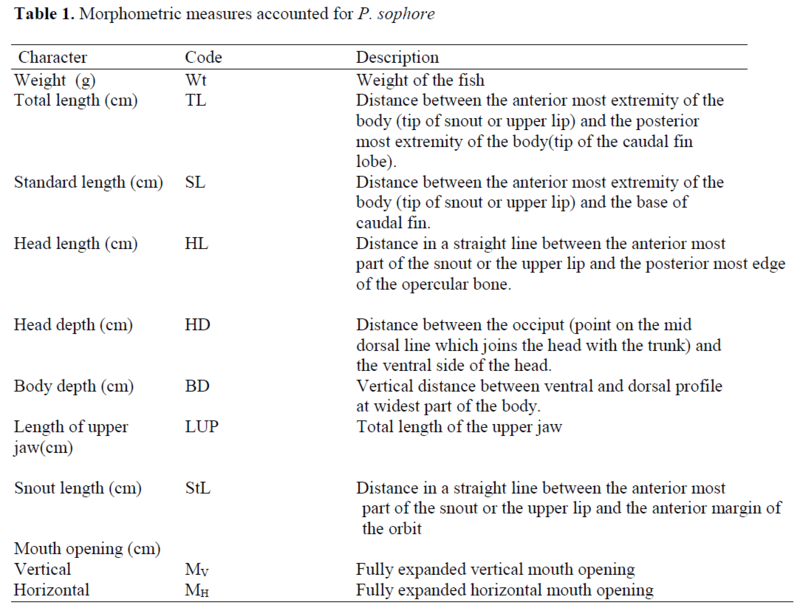 The Table 1 gives details of morphometric measures documented. Table 1: Morphometric measures accounted for P. sophore. The mouth dimensions of the fish studied were maximum vertical (MV) and horizontal (MH) mouth openings. The mouth area (MA) was determined from MV and MH following Erzini et al., (1997). Guts were carefully dissected out from fish body and preserved in 10% formalin for further study. The gut of each fish was then dissected out and gut contents were removed on a petri disc. Organisms were identified as algal and animal group under compound microscope at 100× and 400×. Organisms from each gut were counted under microscope and expressed as percentage of the total number of organisms in all fields exam-ined. Pearson correlation coefficient (r) is computed to understand correlation within morphometric measures and between food types from the gut and morphometric measures. One way ANOVA is performed to understand differences between means. Significance levels are fixed at p<0.05 and p<0.01. The software SPSS 16.0 was used to perform all statistical analysis. The morphometric data and condition factor (K) are reported in Table 2. The specimens have TL ranging from 5.8 to 8.5 cm and Wt from 2.301 to 8.097 gm. The corresponding maximum gut lengths were from 18.3 to 35.5 cm. The mean values of LUP, StL, MA were 0.4(±0.06), 0.4(±0.06) and 0.16 (±0.03). The fish has very narrow range of vertical and horizontal mouth openings (Table 1). The vertical mouth openings ranged between 0.5-0.6 mm and horizontal mouth opening ranged between 0.3-0.4 mm. Maximum mouth area observed was 0.19 mm2 (Table 2). Pearson correlation was computed with mouth area for all body measures and the correlation was found significant for TL, StL, BD, HD, Wt and LUP (Table 3). RGL was not significantly correlated to MA. Table 3: Correlation between morphometric measures to mouth area, plant and animal originated food availability in P. sophore. The total phytoplankton populations in the gut contents of fishes were mainly represented by fil-amentous algae, diatoms like Nitzschia sp, Melosira sp, Synedra sp, Desmidium sp, Calo-thrix sp, Oscillatoria sp, Closterium sp, Scenedesmus sp, Navicula sp, Oedogonium sp, etc. The zooplankton populations in the gut con-tents of fish were represented by crustecea, cla-docera, rhizopoda, actinopoda, copepods. Some nematodes and eggs of trematod were also pre-sent. Few unidentified parts from animal origin were also recorded from the gut. The Pearson correlation for food types to morphometric measures are shown in Table 3. The TL and StL are negatively correlated to plant food types (p<0.05), whereas RGL, GL and LUP are positively related to plant food types (p<0.01). With animal food types, RGL and GL are negatively correlated (RGL, p<0.01; GL, p<0.05) and TL, StL and LUP are positively correlated (p<0.05). The nature of curve of the food abun-dance (plant and animal originated) plotted against total length (Figure 1.) showed decreasing trend of plant originated food category in the gut with increase in total length. With animal food types, the graph progresses slowly during initial period but steeply at later stages. Morphometric measurements of P. sophore showed significant correlation with the fish size, especially between total length and mouth area. The position, shape and size of the mouth are re-lated to diet of fish. Fishes feeding at the surface or in the middle of the water column frequently have a dorso-terminal or terminal mouth. In bot-tom feeding fishes, mouth is sub-terminal in po-sition. Mouth of P. sophore is terminal and teeth absent in the jaw. Slightly longer Upper jaw (maximum 0.5cm) indicates it to be column feed-er. Absence of teeth in mouth and lack of stom-ach with very long and highly coiled intestine suggest herbivorous feeding nature of this fish. But the gut analysis from present study clearly showed that the fish not only feeds on phyto-plankton but also receives large portion of zoo-planktons at longer total length. This indicates that fish adopts omnivorous nature as it grows. Such results concur with the observation of Phukan and Biswas (2012) who suggested it to be omnivorous. The positive and significant correlation of mouth area to total length in P. sophore could be due to increased feeding as it grows. Feeding ac-tivity, growth, mouth area and prey type are sig-nificant in fish (Karpouzi and Stergiou, 2003). Large size fish have larger mouth area. As in pre-sent study, mouth is not significantly correlated to food types and hence, such positive correlation to total length could be indicative of its increased feeding activity as it grows. Snout length also shows similar pattern of feeding nature in this fish. Intake of food might have caused increased body weight of the fish. Though body weight has been criticized as unreliable measure for fish growth due to sexual maturity, during the present study fish without eggs only were considered for study. The fish basically preferred Bacillariophyceae and chlorophyceae from plant originated food materials and few minor phyla along with some protozoa from animal originated food materials. From Pearson correlation, it is evident that the fish has reduced preference to plant food with in-crease in the total length. With increase snout length, the reduced preference to plant food items indicated it to be an omnivorous or carnivorous in the later stages of growth. 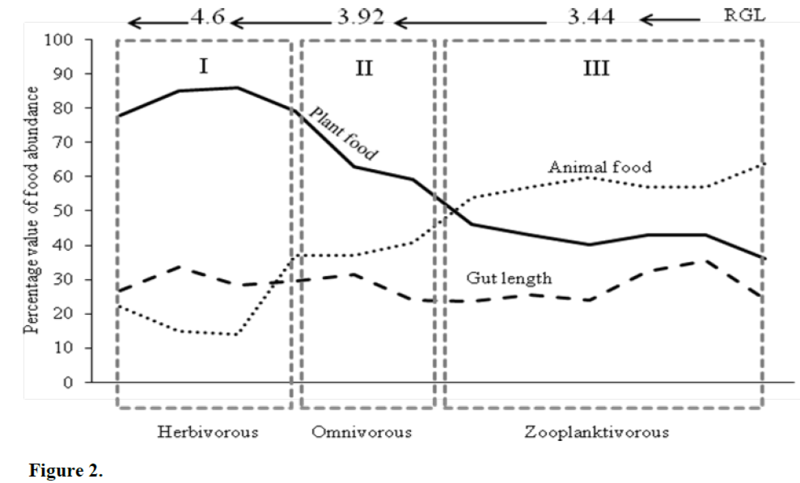 The positive corre-lation of gut length to plant food type suggests it to be herbivorous in nature at maximum gut length. An elongated gut helps in digesting plant originated food materials. 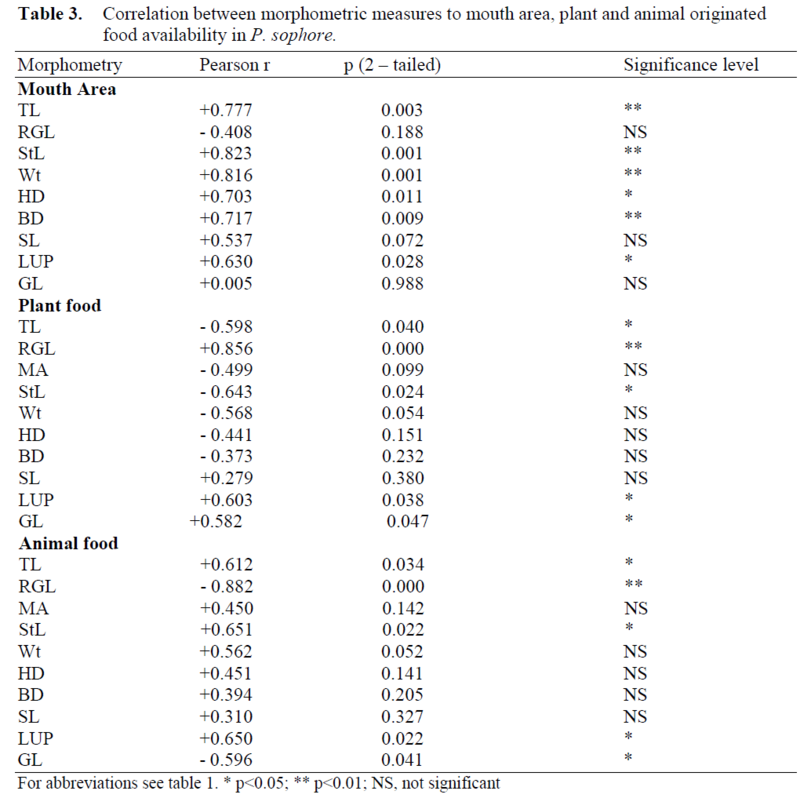 However, of all mor-phometric categories, RGL showed highest posi-tive correlation to plant food types. As RGL is ratio of gut length to total length, this relation was influenced by positive correlation of gut length to plant food types. 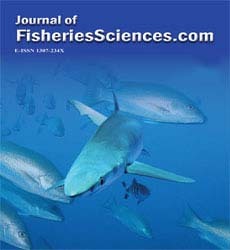 For animal originated food types, total length exhibits positive correlation indicating fish grows faster when it received animal food from the en-vironment. Animal food has always direct effect on growth on fish than plant food (Smith, 1980). However, as total length increases, the RGL de-creases and therefore, it shows negative correla-tion to animal food type. Indirectly, here, the growth of gut length and total length are not pro-portionate. At early stage of growth, the fish re-ceived plant originated food items. In the later stages, rapid growth of the fish was reflected through increased total length but not gut length resulting smaller RGL. This is why at later stage gut length exhibited negative correlation to ani-mal food types. Indirectly, smaller the RGL the fish tends to accept animal originated food items. Dasgupta (2004) reported average RGL value is 0.70 in carnivorous fishes, 4.77 in herbivorous, 1.37 in omnivorous and 3.70 in planktivorous fishes. When plotted against total length (Figure 2. ), it was obvious that the fish rejected animal food when total length was short; however, with in-crease in total length, animal food items were preferred. At the highest total length (8.5cm), the fish received only 40% of plant food items whereas animal food items increased to 60%. It is evident that the fish received plant food items (70-90%) up to total length 7.0 cm, thereafter the tendency towards plant food item declined and at a total length of 7.59cm both the food items were preferred equally and at a length of 8.5cm only 40% plant food items were chosen. Therefore, considering the food preference based on total length, the food habit of fish P. sophore can be grouped into three total length categories – (i) 5.0-7.0cm (ii) 7.1-7.59cm (iii) 7.6-8.5cm. These groups with corresponding food items and RGL and differences (one way ANOVA) among them are also shown in Table 4. Thus, the fish is herbivorous in nature when it attains a total length of 5.0-7.0cm. The average RGL at this stage is 4.6. It tends to exhibit om-nivorous feeding habit (50% animal and 50% plant food) for total length 5.59-7.1cm. The RGL for such feeding nature is 3.9. Beyond that, up to 8.5cm, though the fish retains omnivorous nature, it receives substantial amount of zooplankton (60%). The corresponding RGL is 3.44. Bashar, M.A., (2011). Spotfin swamp barb: Pun-tiussophore. Bangladesh Fisheries Infor-mation Share Home. (en.bdfish.org/2011/01/spotfin-swamp-barb-puntius-sophore/). Accessed on 22/04/2012. Dasgupta, M., (2004). Relative length of the gut of some freshwater fishes of West Bengal in relation to food and feeding habits, Indian Journal of Fisheries, 51(3): 381-384. Mookerjee, H.K., Sengupta, S.N., Roy Choudhury, D.N., (1946). Food and its per-centage composition of the common adult food fishes of Bengal, Science & Culture, 12(7): 247. Pethiyagoda, R. (1991). Freshwater fishes of Sri-Lanka. The wildlife Heritage Trust of Sri-Lanka, Colombo, 362 p.
Phukon, H.K., Biswas, S.P., (2012). Observation on the Maturity Index and Fecundity of Pun-tiussophore(Ham-Buch) from Upper As-sam, Asian Journal of Experiment and Bio-logical Science, 3(1): 247-250. Rahman, A.K.A., (2005). Freshwater Fishes of Bangladesh. Dhaka, Zoological Society of Bangladesh, 133 p.
Roos, N., Wahab, M.A., Chamman, C., Thilsted, S.H., (2007). The role of fish in food based strategies to combat vitamin A and mineral deficiencies in developing countries. Sym-posium: Food-based approaches to combat-ing micronutrient deficiencies in children of developing countries, 12-15 December, Bangladesh, 65p. Shafi, M., Quddus, M.M.A., (1982). Bangla-deshermatshawsampod (in Bengali). Dha-ka: Bangla Academy, 121-122 p.
Smith, L.S., (1980). Digestion in Teleost Fishes. Fisheries and Aquaculture Department, Rome. 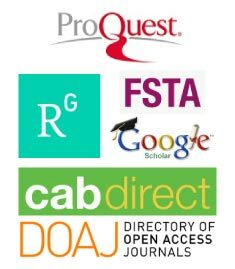 (www.fao.org/docrep/X5738e02.htm). Ac-cessed on 22/04/2012. Thilsted, S. H., Roos, N., Hassan, N., (1997). The role of small indigenous fish species in food and nutrition security in Bangladesh. NAGA, ICLARM Quarterly, December, 13-15 p.